We provide unique craft courses and workshops in the Midlands in sewing and fabric crafts and supply basic requirements for sewing, embroidery and knitting. We also have a selection of gifts and practical items in hand turned wood. The shop and teaching centre is run by me, Susan Eleanor Sands. I have been involved in crafts for 50 years and teaching for 25. There is a warm welcome for everyone who comes to the shop for a chat, a cup of coffee or to participate in any of the on-going craft sessions and we have many regulars who have become friends. The courses run from the Old Flower Shop are mainly general teaching classes and walk-in craft sessions where you can come to the shop with your own project and help will be given on an hourly charge basis. There are also specialised craft courses. The aim of these courses is to teach the basics of specific crafts or improve your skills in crafts you are already familiar with. We aim to provide all the necessary materials as part of the course fee and courses will generally be set up to allow you to take home a completed item. Any exception to this will be stated on the course details. See all the information on the day courses at the bottom of the page. You can get to us by car and by bus from Stourbridge. 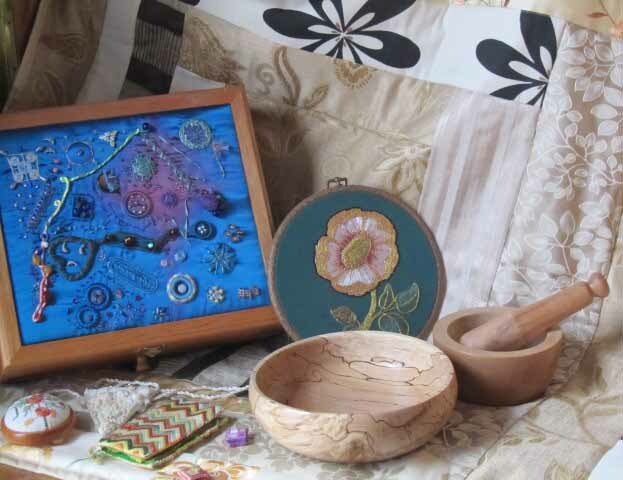 We run 2 hour mixed craft courses where projects are organised for you or you can pursue your own project if you wish. These projects can take up to 6 weeks to complete. A charge of £4.00 is made for each session. Coffee or tea is included. The courses take place every Wednesday and Friday morning from 10.00am until 12.00 midday. We also run Kinver Kraft Club on a Thursday evening from 7.00pm until 9.00pm where like minded people meet to pursue their own crafts and drink coffee. We also run a knit and natter afternoon on Fridays from 2.00pm until 4.00pm. If you would like to join just let me know. There is a nominal charge of £2.50 for each session. This is a craft club for those of you who are unable to visit us during the week but would really enjoy being with like minded people and if necessary get advice on your chosen craft. We cover most fabric crafts, embroidery, knitting, crochet, spinning................. and we cater for all levels of ability. Bring your own craft projects and get advice or learn a new skill for the craft you have always wanted to try. There is no limit to how creative you can be. There are two sessions a day, the first runs from 10am to 12noon and the second from 1pm to 3pm. Each session costs £5.00 for the two hours. Come and join us on the first and second Saturday in every month. A friendly welcome awaits you at Crafts by Eleanor in Kinver. Booking is advisable, because it has proved to be very popular and we have limited space.